Today is the disappearance day of Shrila Narottama Thakura dasa, so it is a very sacred day. Shrila Narottama dasa Thakura took birth in West Bengal as the son of a very great king, and he was a beautiful prince. The king was one of two brothers, but there was only one son in the family. Still, from the beginning of his life he was very pure and devoted, and he remained a life-long brahmacari, never marrying. At the age of sixteen he left home and went to Vrndavana with Shri Syamananda Prabhu and Shrinivasa Acarya. He had desired the darsana of Shri Caitanya Mahaprabhu who was in Jagannatha Puri at that time, but when he was on his way to Puri he heard that Shriman Mahaprabhu and His associates, like Shri Svarupa Damodara, Shri Raya Ramananda and Shri Gadadhara Pandita, had all disappeared. This broke his heart. He therefore changed the destination of his journey and went to Vrndavana. On the way, however, he heard that Shrila Rupa Gosvami and Shrila Sanatana Gosvami had also disappeared. Still present in Vrndavana at the time was Shrila Raghunatha dasa Gosvami, residing at Radha-kunda. Shrila Raghunatha dasa Gosvami had been in Jagannatha Puri when Shri Caitanya Mahaprabhu and His associates disappeared. At that time he had decided to go to Vrndavana to jump from Govardhana or to jump in the Yamuna, to give up his life. He first decided to die by jumping in the Yamuna, but he saw that there was very little water there because Yamuna herself was feeling separation from Krsna. Then he thought, "I should go to Govardhana; I will jump from the top of Govardhana and thus give up this life". Shrila Rupa and Sanatana Gosvamis were still there at that time, and they consoled him by saying, "If by giving up this life one can have the darsana and service of Shri Shri Radha and Krsna, we would be the first persons to give up our lives. But we know that Lord Shri Krsna is not achieved by this. You should not try to do so; you should do bhajana." He then went to Govardhana to perform bhajana. His mode of worship was so severe that no one can follow him. It was very, very hard. He ate practically nothing and was always weeping, always chanting, always remembering, and sometimes he was rolling on the bank of Radha-kunda. Later, when he heard that Shrila Rupa Gosvami had left this world and entered aprakata-lila (the unmanifest pastimes of Radha and Krsna), he felt unbearable separation. He thought, "I don't want to live at Radha-kunda, because it now seems like the gaping mouth of a tiger, and Giriraja Govardhana seems like a very large python. Everything in Vraja seems to be void, without life. Under these circumstances I cannot remain alive." He expressed his separation by these words in his prayers. This was the general mood of separation after the disappearance of these great personalities. In the meantime, Shrila Narottama Thakura, accompanied by Shrila Syamananda Prabhu and Shrinivasa Acarya, came to Vrndavana, seeking the shelter and guidance of a Vaisnava. The three of them approached the lotus feet of Shrila Jiva Gosvami, who was at that time residing at the Shri Radha-Damodara temple. Shrila Jiva Gosvami was very happy to see them. He considered that Lord Krsna and Shri Caitanya Mahaprabhu had personally arranged for these three young devotees to be given classes on all the teachings of Shrila Rupa Gosvami, Shri Caitanya Mahaprabhu, Shrila Sanatana Gosvami and the other great acaryas. He was very pleased to have students like them, and he began to teach them sastras like Sat-sandarbha, Brhad-bhagavatamrta with the explanations of Shrila Sanatana Gosvami, Brhad-vaisnava-tosani, Hari-bhakti-vilasa, Bhakti-rasamrta-sindu, Ujjavala-nilamani and many others. Thus, the three devotees very quickly became masters of all the subject matters. During this period, Shrila Jiva Gosvami was accepted by the entire Vaisnava community as the "Vaisnava king", the topmost Vaisnava, of three mandalas: Shri Navadvipa Mandala, Shri Vraja Mandala, and Shri Ksetra Mandala (Jagannatha Puri). He established the Visva Vaisnava Raja Sabha. "Visva" means world and "Vaisnava-raja" means pure devotees. He established Visva Vaisnava Raja Sabha for the whole world, so that any person in any part of the world can come to that spiritual institution, to inquire from pure devotees and to read and study Vaisnava philosophy. Shrila Jiva Gosvami was the second president of that society, Shrila Rupa Gosvami having been the first, and that society still exists today under different nomenclatures. Sat-Sandarbha is the scripture of Shrila Jiva Gosvami. It is an exceptional book regarding Vaisnava philosophy and the culture and principles of Vaisnava etiquette and procedures. The thoughts of Shrila Jiva Gosvami in Sat-Sandarbha appear in Shri Caitanya-caritamrta and all other Gaudiya Vaisnava literatures. Sat-Sandarbha came first, and after that, Shri Caitanya-caritamrta. All its essence has been taken from Sat-Sandarbha. At that time, only those given the consent and authority of Shrila Jiva Gosvami were considered learned and qualified Vaisnavas. On this basis, one would be accepted as a Vaisnava by the entire society of Gaudiya Vaisnavas in the three places: Navadvipa, Jagannath Puri and Vrndavana. Vaisnavas from every part of India used to come to Shrila Jiva Gosvami to study the sastras under his guidance. Although Shrila Narottama dasa Thakura, Shrila Shrinivasa acarya and Shri Syamananda Prabhu were not his initiated disciples, Jiva Gosvami adopted them and became their siksa-guru, giving them all siddhanta. He taught them Shrimad Bhagavatam, Sat-Sandarbha, all the books of Shrila Rupa Gosvami with an emphasis on Shri Bhakti-rasamrta-sindhu and Shri Ujjvala-nilamani, the books of Shrila Sanatana Gosvami like Shrimad Brhad-bhagavatamrtam, and all the other books of Gaudiya Vaisnavism. Although these three devotees had their own diksa-gurus, they held greater respect for Shrila Jiva Gosvami. If the siksa-guru is fully qualified, he should be respected as much as Krsna, and if diksa-guru is similarly qualified, he should be also treated like that, as a manifestation of Lord Krsna. If both are qualified, both should be given equal respect and regarded as Krsna's manifestations. Siksa-guru is not inferior to diksa-guru, and in some cases he is superior to diksa-guru. This is according to qualification. Shrila Jiva Gosvami never made any formal disciple. He never gave anustanika-diksa (fire sacrifice); he gave only Krsna-siddhanta, which is more important than the fire sacrifice and other rituals. Shrila Sanatana Gosvami never initiated any disciples and Shrila Rupa Gosvami only initiated one – Shrila Jiva Gosvami – but all the Vaisnavas of the world consider them to be even greater than both their diksa and siksa-gurus. Do you treat Shrila Sanatana Gosvami and Shrila Rupa Gosvami as Guru? You should; they are siksa-gurus and are nearer to Krsna. Every day we say the prayer, "Vande 'ham sri guru sri jutah padakamala...sri rupam sagrajatam..." Therein the word "sagrajatam" means elder brother. Sanatana Gosvami is the elder brother of Rupa Gosvami. You must all utter this prayer daily – each morning. This is a very good prayer by Shrila Krsna dasa Kaviraja Gosvami, as all other prayers are included within it. All Gurus and Vaisnavas are included; the six Gosvamis are there, all the associates of Shriman Mahaprabhu headed by Lord Nityananda and Shri Advaita Acarya are there, all the associate sakhis of Shrimati Radhika are there like Shrimati Lalita and Visakha devis, and all the manjaris headed by Shri Rupa Manjari are there. It is a very good pranama – everything is in one mantra. Imparting everything he knew to those three Vaisnavas, Shrila Jiva Gosvami told them that although he had accepted them as more than disciples, they would have to take diksa from others. Syamananda Prabhu was already initiated by Hrdaya Caitanya Gosvami of Kalna, but Shrila Narottama dasa Thakura and Shrinivasa Acarya were not yet initiated. Jiva Gosvami ordered Shrinivasa Acarya to be initiated by Shrila Gopala Batta Gosvami, and he instructed the three to treat all qualified Vaisnavas as guru. After his teaching to Shrila Narottama Thakura was completed, he directed him, "Go to Shrila Lokanatha dasa Gosvami and try to make him your diksa-guru." The Thakura said, "I have been given everything by you and I have accepted you as my Guru. I don't believe there is anyone in all of Vraja who is as qualified as you. You are akincana, niskincana (without any material desires), and a parama-tattva-rasika Vaisnava (one who has realized all established truths and is tasting all devotional mellows). I want to be initiated by you." Shrila Jiva Gosvami denied the request, considering that he was not qualified. He directed him to go to Shrila Lokanatha Gosvami, saying, "I am your Guru, but you should go to him." Shrila Lokanatha Gosvami was an associate of Shri Caitanya Mahaprabhu. He had come to Vrndavana with Shrila Bhugarbha Gosvami to do bhajana. He had requested Shrila Krsnadasa Kaviraja Gosvami not to write anything about him in Shri Caitanya-caritamrta, and Shrila Krsnadas Kaviraja followed his instruction. He was an akincana niskincana Vaisnava (having nothing but Shri Krsna as his own). He had no money and no home. He had nothing to claim as his own. He had made up his mind not to make disciples, lest his mind be diverted towards them. He considered, "So many disciples will come and say, 'I will perform service and I will prepare everything for you.' 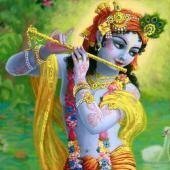 They will do biksa (collect donations) and give money to me, and then praise will come and I will be diverted from Krsna." He made up his mind, "I will not make any disciples, but if anyone comes to me I will give him krsna-katha." Narottama dasa Thakura was so akincana that when so requested by Shrila Jiva Gosvami, he approached Shrila Lokanatha Gosvami, fell flat at his lotus feet and prayed, "Please initiate me. I am not qualified, yet I want your initiation." Again and again Narottama Thakura requested Shrila Lokanatha dasa to accept him, but Lokanatha dasa refused every time. He would make statements like, "You have grasped all siddhanta from Shrila Jiva Gosvami. I cannot initiate you. I have no disciples and I don't want to create any disciples". After some days Shrila Lokanatha Gosvami began to wonder, "Who is the "thief" who comes daily and cleans my place of passing and the path to that place? Who is that person?" One day he decided to investigate. He used to do bhajana throughout the night without sleeping, so one night he hid in a kunja and watched to see who had been coming and cleaning. In the dark of night that very beautiful prince Shri Narottama Thakura came there. He was just about to clean the area when Lokanatha Gosvami appeared and caught hold of his hands asking, "Who are you?" The prince replied, "I am dukhi Narottama, unhappy Narottama. I am a worthless and useless person. But I am a recipient of the mercy of Shrila Jiva Gosvami and I want to do bhajana of Krsna, so please be merciful to me." "And why are you doing this?" asked Shrila Lokanatha Gosvami. He took Shrila Narottama dasa to his bhajana kutir and told him to bathe in the nearby Yamuna in the early morning. Narottama dasa was then initiated by Shrila Lokanatha Gosvami in the krsna-mantra, that is, the gopala-mantra, and in the kama-gayatri mantra – 'klim krsnaya' and 'klim kamadevaya'. He continued to serve his guru, who arranged a separate bhajana kutir for him nearby his own and gave him many instructions. He told him, "Give up all worldly desires; do not go anywhere for anything, and do not associate with common people. Always chant harinama and always think of the pastimes of Lord Krsna. Be trnad api sunicena taror api sahisnuna, more humble than a blade of grass and more tolerant than a tree." He instructed him to always stay there at his bhajana kutir, always chant harinama, and always think of the pastimes of Krsna. Narottama dasa followed all those instructions. One very hot summer day, a thirsty farmer came to Shrila Lokanatha dasa Gosvami, requesting water. There was a well nearby, and Lokanatha Gosvami had a rope and bucket, but he was chanting harinama – Hare Krsna, Hare Krsna, Krsna Krsna, Hare Hare – absorbed in remembering the pastimes of Krsna and sinking in the ocean of rasa. He had no outward awareness and therefore did not respond to the farmer, who then went to the young mahatmaji and asked, "Oh chota baba, little baba, I'm so thirsty and I have no rope and bucket. Please give me water". The farmer twice made this request of the Thakura, who was in the midst of his bhajana. The Thakura left his harinama mala and went to fetch water from the well, and he gave that water to the farmer, who drank it and went on his way. In the meantime Shrila Lokanatha Gosvami returned to external consciousness, and he knew everything that had happened. He called the young babaji, Shrila Narottama Thakura, and told him, "You should at once return to your home. I don't want a disciple like you. I will not permit you to do bhajana here with me. You have so many desires. You are a very kind man to all, so return to your kingdom, live in your palace and be charitable to your people. You should give them all water, bread and butter, clothes, and everything else. You cannot do bhajana as yet." "Because you have no idea of Shri Krsna's name. Krsna's name is Krsna Himself, and Hare Krsna means Shri Shri Radha-Krsna. There is no difference between Radha-Krsna and Their names. When a Vaisnava chants the names of Radha and Krsna and Hare Krsna, he understands he is serving Krsna directly, in the kunjas of Vraja. You think that the service of Radha and Krsna in the kunjas is less important than quenching the thirst of a common person who doesn't do bhajana. So you should do bhajana at your palace, and at the same time engage in all these ordinary pious activities. I will not accept you here." Shrila Narottama Thakurs began to weep and said, "The farmer was so thirsty." Shrila Lokanatha Gosvami replied, "Perhaps you don't know that nama and nami are the same. When you are chanting harinama you should think, 'I am serving Shri Radha and Shri Krsna.' Hara is Shrimati Radhika, who controls the mind and heart of Krsna. From Hara comes Hare, meaning 'O Hara', or 'O Shrimati Radhika'. Rama is Radha-Ramana, Shri Krsna. So Hare Krsna is Radha-Krsna, and while chanting we should serve Them, remembering Their pastimes. Giving up the service of Radha and Krsna you went to quench the thirst of an ordinary person. You thought that giving that water was more important than serving Them; so you should return to worldly life and do anything there. I don't like this behavior." Although Shrila Narottama cried and pleaded, Shrila Lokanatha dasa Gosvami did not allow him to stay in Vrndavana. Do you understand his siddhanta – his view? It is very high, but it is actual; factual. Nama cintamani krsna caitanya rasa vigraha / purna suddha nitya mukta abhinnatvad nama naminoh. Nama and Krsna Himself are the same. In another sense Krsna has manifested all His power in His name, more so than in His form. From the beginning of creation of this world until the end, His name can deliver one to Goloka Vrndavana, but He Himself cannot do this. He will not deliver the nama-aparadhis, offenders to His name, but His name will do something. In some cases, therefore, krsna-nama is superior to Krsna Himself, because He has invested all His powers therein. When we chant Lord Krsna's name we should be completely absorbed in that, remembering the pastimes of Krsna and Shri Caitanya Mahaprabhu, as well as the mercy of Nityananda Prabhu. We should try to be absorbed like Shrila Rupa Gosvami, Shrila Sanatana Gosvami and Shrila Raghunatha dasa Gosvami. They were always chanting and serving Radha and Krsna. They often sat together chanting, and they were oblivious to the passing of day into night and night into day. Shrila Narottama dasa returned to his kingdom in East Bengal and widely preached the glories of Radha and Krsna and his Gurudeva. He established several temples, such as Radha Madana-mohana, Radha-Govindaji, Radha-Gopinatha, Radha-Ramana, as well as those of Shri Caitanya Mahaprabhu and Shri Nityananda Prabhu. He began to preach through his kirtanas, and he became a very well-known kirtaniya. He preached in Assam and Manipur and in all the Eastern provinces. At that time no one in these regions knew anything of krsna-bhakti, and all were ignorant of dharma, but nowadays hundreds of thousands of Vaisnavas are there. He invited all the Vaisnavas from Vraja Mandala, Navadvipa Mandala, Ksetra Mandala and Gaura mandala, to come there to Kheturi, and countless devotees came. He called Nityananda Prabhu's sakti, Shrimati Jahnava Devi to preside over that gathering. When he performed kirtana of Radha-Krsna, Shri Caitanya Mahaprabhu with all His associates appeared there and began to do kirtana, mixing their voices with his. This was visible to all the devotees present, and tears came in everyone's eyes. All were amazed and wondered, "What are we seeing? Are we seeing a dream or are we seeing reality?" Then, when the kirtana ended, Shri Caitanya Mahaprabhu and His associates at once disappeared. Narottama dasa Thakura discovered a new type of kirtana, and that kirtana is followed by all Gaudiya Vaisnavas to date. We Gaudiya Vaisnavas are known as Narottama-parivara, the family of Shrila Narottama dasa Thakura. He was a very pure bhakta, empowered by the energy of Shri Caitanya Mahaprabhu. Once, accompanied by Syamananda Prabhu and Shrinivasa Acarya, Shrila Narottama dasa Thakura was bringing all the Gaudiya Vaisnava books to Bengal for preaching. On the way, however, having heard that the three devotees were carrying a valuable treasure, jewels, a dacoit king looted all the books. These books were jewels indeed, but not worldly jewels; they are spiritual jewels. Shrinivasa Acarya sent Narottama Thakura and Syamananda Prabhu to Bengal, and he remained there searching for the books. At last he came to the king's palace, where the king begged apology, fell at his lotus feet, and became his disciple. The king's name was Vihambir, and he became a qualified disciple and Vaisnava. Narottama Thakura was kayastha, like a ksatriya, by caste, but in actuality he was beyond caste and creed. He was Lord Krsna's associate; Shri Caitanya Mahaprabhu's associate. It is an offence to categorize any Vaisnava by caste or creed; we should not do this. Vaisnavas have no caste and creed, as the atma has no such designation in this world. Naham vipro na ca nara pati na ca yatir va gopi bhartuh pada kamalayor dasa dasanudasa. We are the servants of Shrimati Radhika – servants of the servants of the servants of the dust of Her lotus feet. This is our pure identity. We are not brahmana, ksatriya, vaisya, or sudra, nor we are grhastha, brahmacari, vanaprastha or sannyasi – nor anything of this world. Our one and only pure identity is Krsna-dasa, servant of Lord Krsna. Narottama dasa Thakura was the associate of Krsna, and He came to serve Caitanya Mahaprabhu by bringing all the worldly people towards Him. This being so, many brahmana families became his disciples, and that caused disturbance in other brahmana sectors, among those who neither understood Vaisnava principles nor the glory of Shrila Narottama dasa Thakura. They alleged that his initiating of brahmanas was improper. He was the son of a king, and for him to give diksa to brahmanas was considered by some to be highly improper. One day they challenged him to debate these points. On the day before the appointed debate, Shri Ramacandra Puri and all Narottama Thakura's other very learned disciples went to the local market-place and, posing as shop-keepers, began to sell items of basic necessity such as clay pots, betel nuts, rice, wheat, and so on. When the opposing party of brahmanas came into the town, they wore big, big turbans. They had titles like sastri, maha sastri, sapta acarya, panca acarya, pancami, and nyaya pancami. They declared that on the next day there would be a meeting to discuss the argued matter, and Shrila Narottama dasa Thakura would come and be present in the meeting. The brahmanas had come from different parts of India, and before the meeting they went from shop to shop to purchase various ingredients. Some were fond of betel nut. Some wanted to do their cooking with their own hands so they went for dry wood and other things. When any one of them went to a shop, a very simple Vaisnava was there. He asked, "What do you want? Who are you and what caste are you from?" The person answered, "My name is such and such." The "shop keeper" replied, "It is not true," and a long discussion ensued. When the person said, "I am brahmana", the "shopkeeper" said, "That is the jati (cast) of this physical body, matter; but we are atma; so you cannot be that designation." The brahmanas were invariably defeated in these discussions. Not only the shopkeepers, but the other customers coming to the shop also asked them, "Who are you?" When the inimical brahmanas told their worldly designations arguments, ensued and all the brahmanas were defeated there. They met in the night and conferred, "How can we show our faces tomorrow? Everywhere in this village the shopkeepers and others are so learned that they defeated us. How can we enter the assembly of Shrila Narottama Thakura himself? They all fled from there during the night. Shrila Narottama Thakura resided by the Ganges. Before the meeting he had become paralysed – he had made himself like that. All his disciples had gone to him and prayed, "O Thakuraji, Gurudeva, if you die now, giving up your body and going to Lord Krsna, all the brahmanas will say it is because you are initiating brahmanas, and this is why you are paralysed and are suffering so much. They will say you have gone to hell. So we pray that you become completely cured, regaining your health. Hearing this, Narottama Thakura became like a young man and began to run here and there. He returned to his asrama, all ill-health and paralysis having completely disappeared. This was observed by those who were saying that he was to go to hell for initiating brahmanas. Then, after coming to his village, some of those brahmanas became paralyzed, some became blind, some were bitten by snakes, etc. Eventually they became so worried that they approached his lotus feet and apologized. He excused them, and again he became paralyzed and went to the bank of Ganges. He entered in the realm of Shri Goloka Vrndavana Dhama and Shri Navadvipa Dhama, Svetadvipa. Narottama Thakura wrote so many songs, such as 'Gauranga bolite ha'be pulaka-sarira', 'Radha-krsna prana mor yugala kisora', and 'Je anilo prema-dhana koruna pracura' – all good songs. He was unparalleled. In the entire Gaudiya Vaisnava parampara he was the most prolific singer of Gaudiya Vaisnava padyavali, and after him only Saptam Gosvami, (the Seventh Gosvami), Shrila Bhaktivinoda Thakura was like this. Both were associates of Shri Krsna and Caitanya Mahaprabhu. So we beg at his lotus feet that today he will be merciful to us and bestow his mercy upon us. We are so unqualified, unworthy and insignificant, but by his mercy we can chant purely, come in the line of Shri Caitanya Mahaprabhu and His associates in guru-parampara, and thus become qualified. We should pray like this today. We pray that the songs he has written should be manifest in our heart, and we can realize and practice all these things truly.